So this is a little late, it was actually mailed last fall, but took me awhile to add pictures and such. 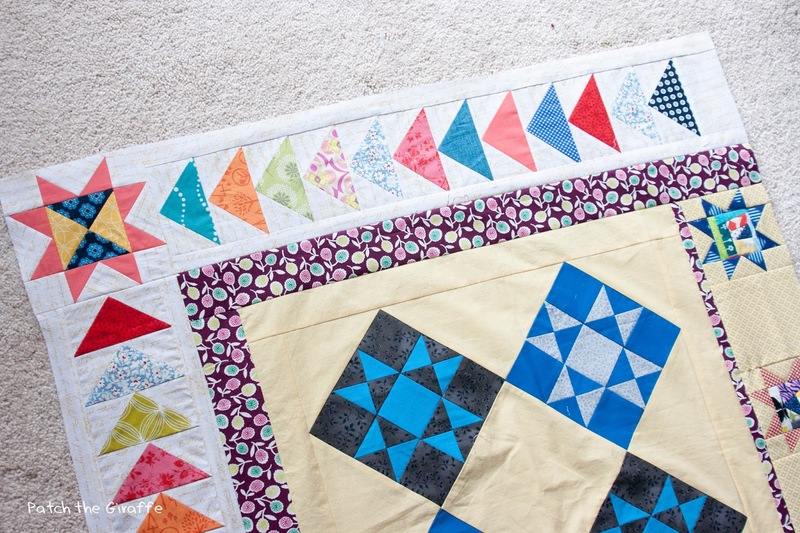 This round robin quilt ground lasted a little over a year, and I think we produced some pretty great quilts. Hopefully everyone else also feels that way! Her quilt is in honor of New Hampshire. There are many other season represented, but I felt like a quilt in honor of New Hampshire had to have winter. I debated what I wanted to do, and started with a skier. I used the Vintage Skier pattern from During Quiet Time because in my mind it was quicker to use her pattern than to make a different winter scene myself. This is a beautiful and detailed pattern, so I’m not quite sure what would have been faster! Next, I thought about what really represents New Hampshire. My husband suggested the Old Man of the Mountain as quintessentially NH. I search for a pattern, but could only find one that the website didn’t appear to sell anymore. So, I went on EQ and designed the Old Man. I realize that there is probably not a huge demand for this, but if anyone else ever needs a pattern for the Old Man of the Mountain, I put my version on Craftsy. So, now I had a skier and the Old Man of the Mountain. I decided to do snowflakes between the two bookends and have some snow and rocks and mountains that I would improv to fill in the difference. I reduced the size of all of the snowflakes because the full size would have been too overwhelming for the section. I guessed at a % to print at and hoped for the best! 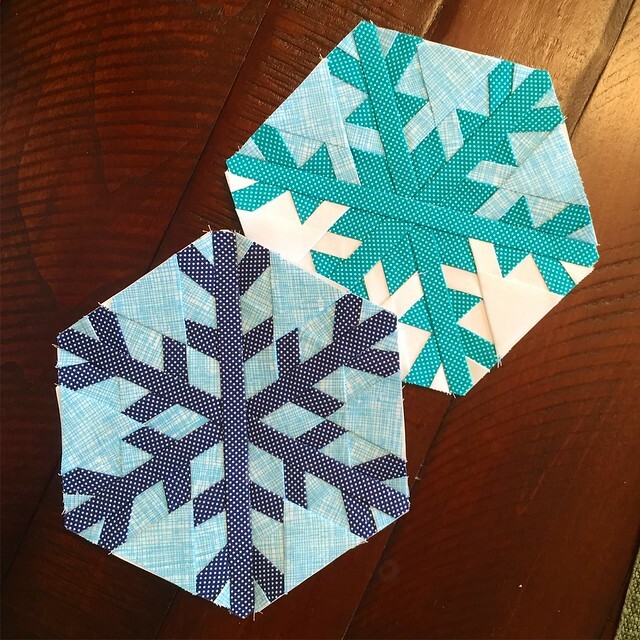 The turquoise and blue snowflakes are Snowflake #7 from the Canuck Quilter. 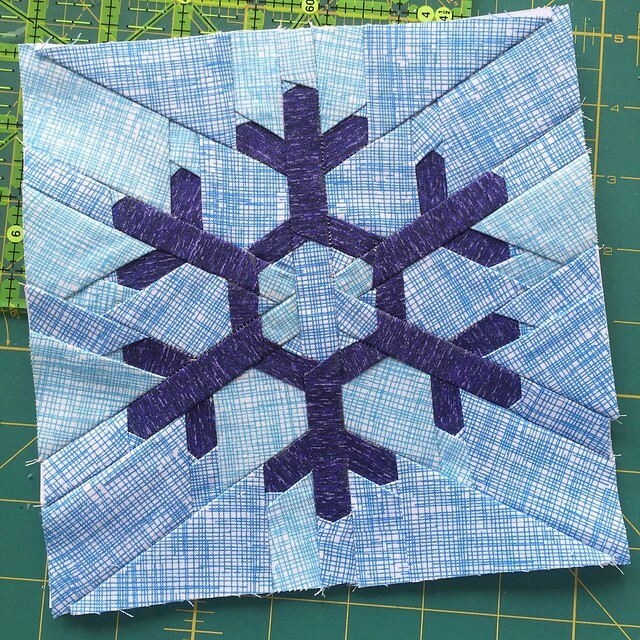 The purple snowflake is from Sewing Under Rainbow. I continued to fill in the space between the snowflakes, which looks easier than it is. I was cursing my decision to have snow covered mountains and rocky ground as I was trying to match both those seams up! I really love how it turned out though, so it was worth it in the end. The only thing I’m slightly disappointed by is the blending of this row with the previous quilt. You know when in your mind you think you put the correct colors in, but when you’re done it’s off? I used a couple different blues in the sky to try to mimic the scrappy backgrounds above it, and from a distance it’s still just a huge block of blue. The white seams also look super annoyingly obvious right now, but I know that they will even out on top of some batting once they are quilted. Also, I know I own white on white fabric but I haven’t seen it since I moved. I’m probably going to find it in about a year stuffed inside some vase we never use or somewhere equally stupid. Thus – why I used solid white. Ladies of Round Trip Quilts, it was a pleasure to work with all of you and I’m really glad I got to have this experience with all of you. Someday I would love to meet all of you in person! 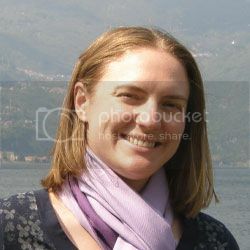 Round Trip Quilts is the round robin bee I am currently a part of – Jennifer has a much better summary of the round robin on her web page than I am even going to attempt to cover. We are on our last round now! I can’t believe we’ve been doing this almost for a year. It’s a been a fun challenge! I have had Leanne from Devoted Quilter’s quilt for the last 2 rounds. We had to do a bit of rearranging after one member had to drop out, so that’s why I had her quilt twice in a row. As you can see from my scribbles, I had a couple ideas of what I wanted to do, and was wishy-washy for a little while before finally just doing almost exactly what I was going to do in the first place. Leanne wanted stars and components of stars. Her original center was 4 Ohio stars set on point. 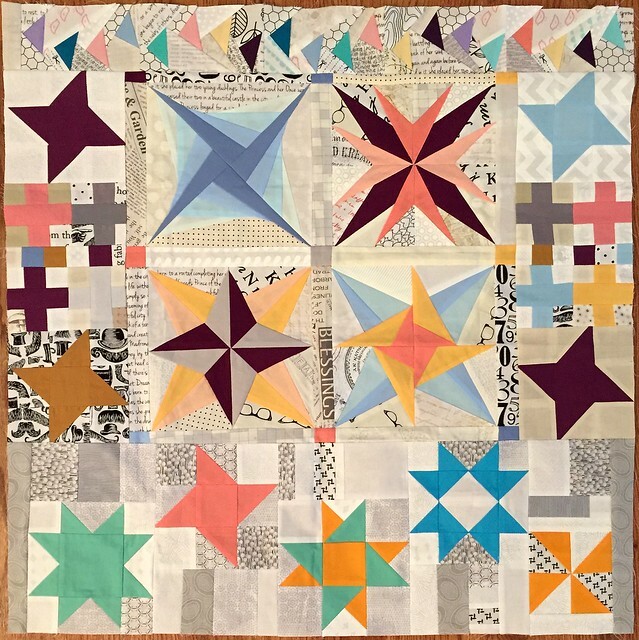 Mary of See Mary Quilt added the next border – with some stars and some color that Leanne had requested added. Chelsea at Patch the Giraffe added some flying geese and lovely color to the mix! Christina at WiPs and Tuts added some more stars to the mix. Another thing I love seeing happen after each round is the direction that each person considers to be up changes. 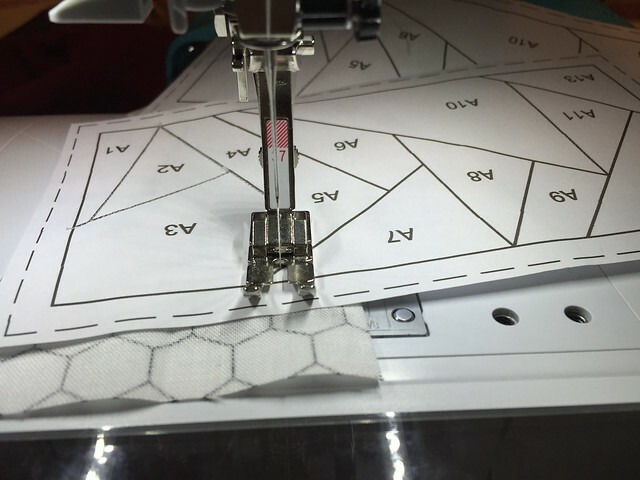 Kim from Ties that Bind Quilting added a zig zag to the quilt. Kim’s zig zag is the top part with the all white background. Then it was my turn… I wanted to bring out some of the elements from the center toward the outside of the quilt. I kept Kim’s zig zag going, but I used yellow to bring the yellow center outward. 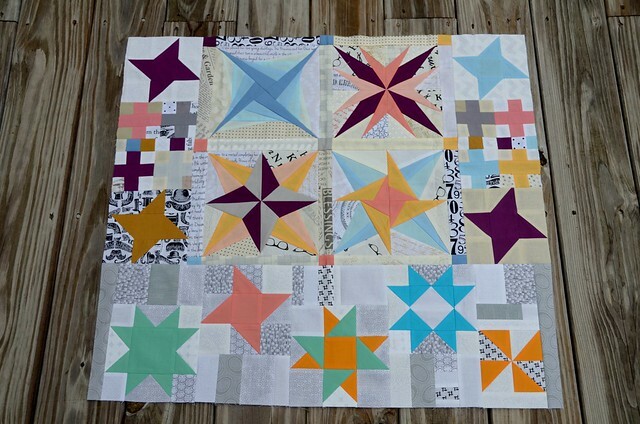 Next, I wanted to play with some paper pieced stars and improv piecing. 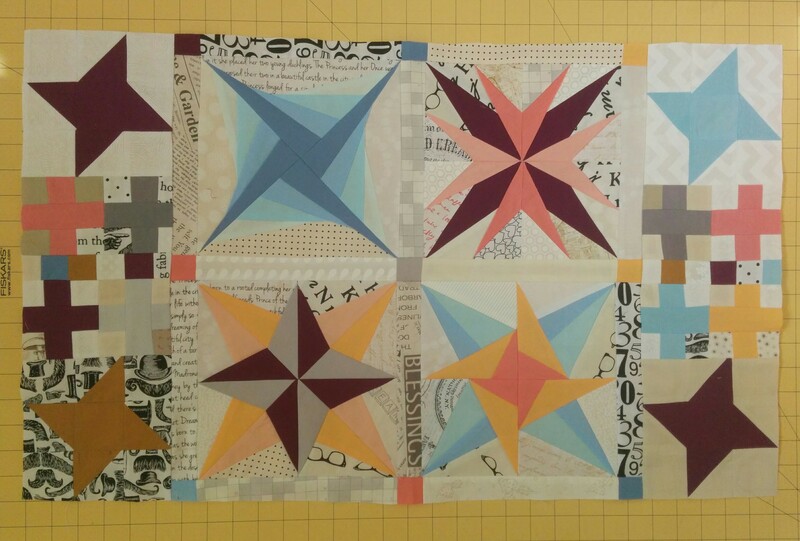 I used (from left to right) the Caldonia Star from 627 Handworks, January and February 2013 Lucky Stars BoM Club, Dark & Light Star from Quilter’s Cache. I did gray low volume fabric for the background to pull the gray out from the original center blocks. 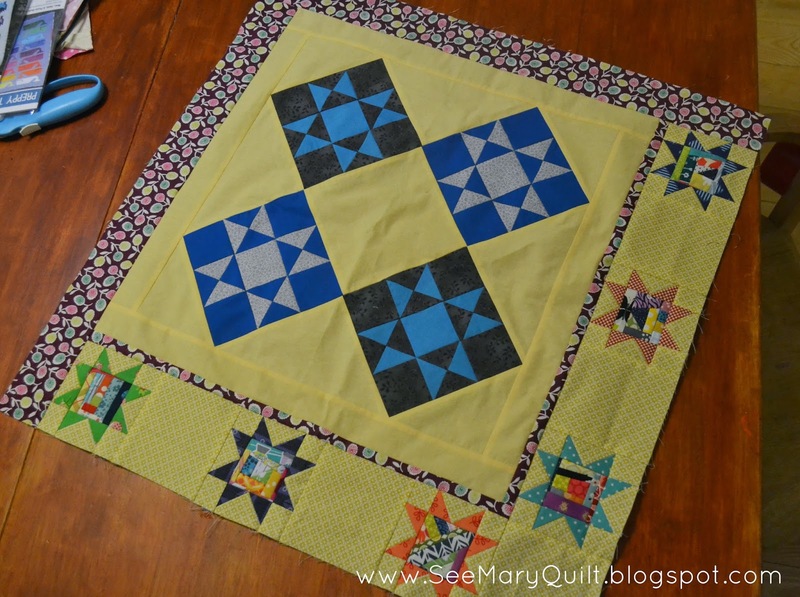 I chose to concentrate on making the stars in light and dark blue from Leanne’s center with the turquoise and fuchsia accents from Mary’s border. Leanne, I hope you like where your quilt is going! 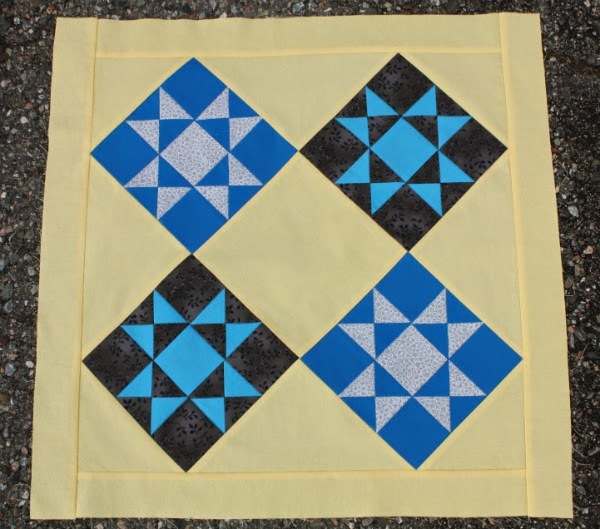 I tried to leave you a lot of space to have some fun quilting on because I know you are enjoying FMQ-ing a lot lately. Jennifer, I apologize for being so ridiculously late mailing this to you. I knew I was moving, and had planned to be done much earlier, but it just didn’t happen. I just finished up my addition for Mary from See Mary Quilt. We are now over halfway through on the Round Trip Quilts, stop 4. This was Mary’s original center. Chelsea from Patch the Giraffe was next, and added these awesome arrows to the quilt. Christina from WiPs and Tuts went absolutely crazy and made what probably felt like a million tiny log cabins. 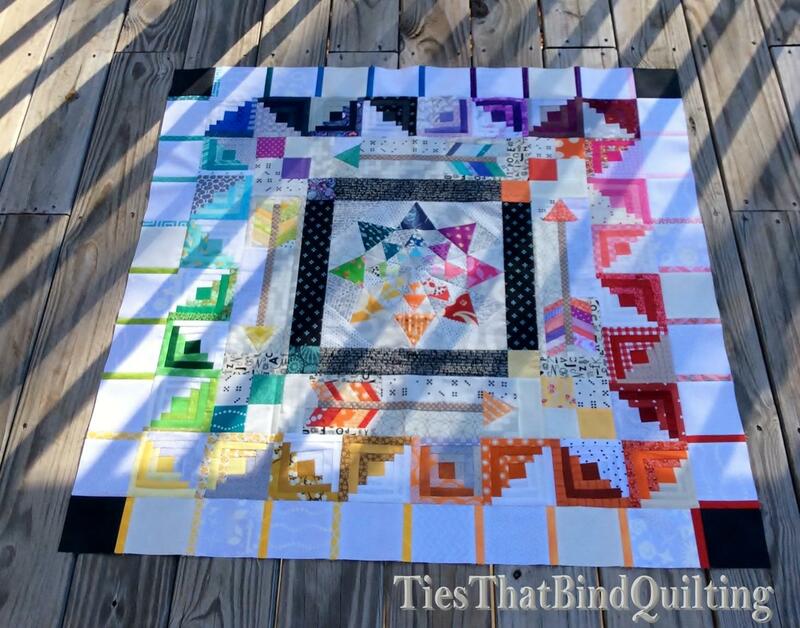 Kim from Ties that Bind Quilting added some needed breathing room while keeping the rainbow theme. Then it was my turn… I started making half square triangles. And kept making more half square triangles. Until I was done. Then I sewed, and sewed, and sewed, and ended up with this awesome herringbone border. 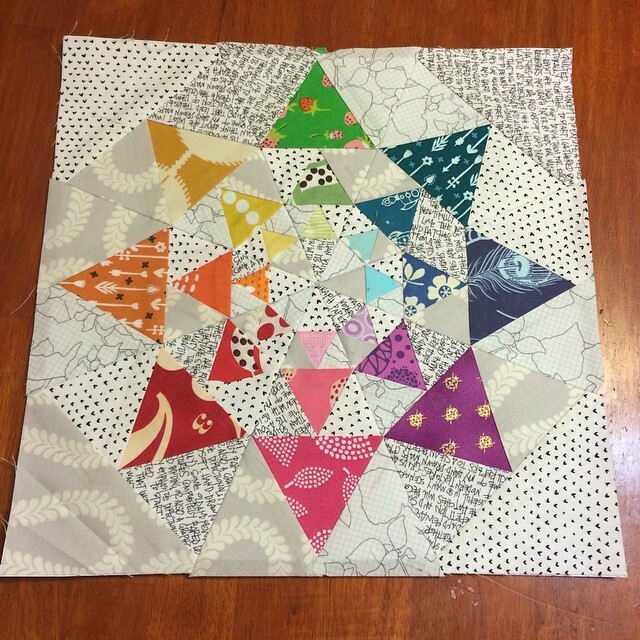 This project has made me want to make a medallion quilt, and to not want to mail this on. It can stay with me, right? I am part of a round robin group made up of quilters from the Plum and June New Blogger Hop last summer. 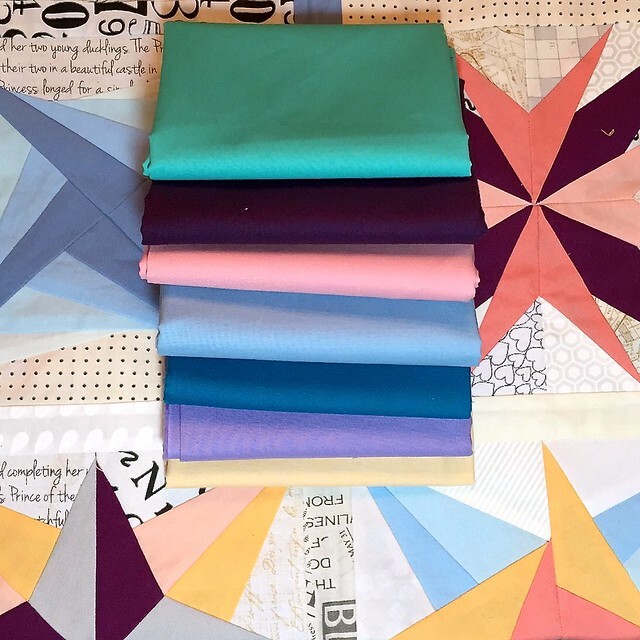 We are on our 3rd round of this round robin, and I’m having a lot of fun and being challenged to continue to come up with something good enough for each of these amazing quilts! This round I have the center from Chelsea at Patch the Giraffe. 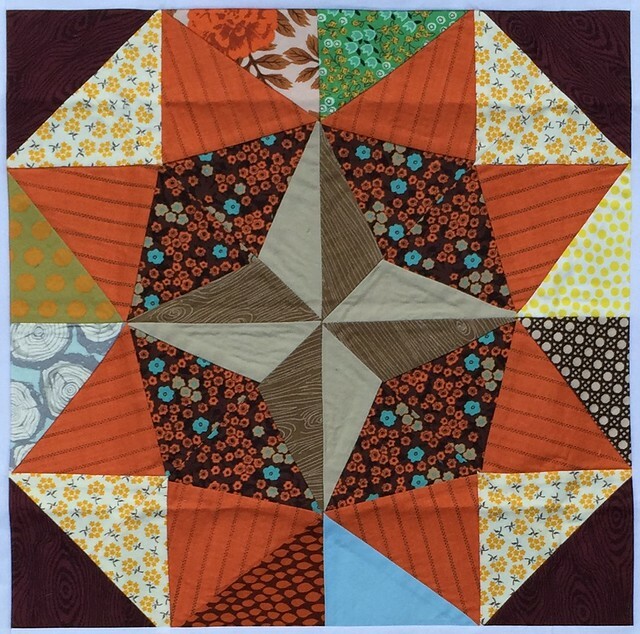 She started us off with four paper pieced stars from solids and a low volume background. She didn’t specify how the additions had to be made, just requested that they be solids with low volume backgrounds. Her original center can be found here. Next, it went to Christina (WiPs and Tuts) who added the two side borders. Kim from Ties that Bind Quilting added the row along the bottom, or rather the top now that I notice Chelsea’s original orientation. Then it was my turn… You can tell I was working late on this and how dark and stormy it was so far in January by my complete and total inability to get good in-process photos. First, I pulled my solids and realized I needed to buy more because I had used up my stash. I like using solids, but don’t have a huge stash of them, but was still surprised by how little I had. Luckily these are colors that I personally enjoy, so I had no problem adding a few to the stash. I used the “Goosing Borders” pattern from Jeli Quilts on Craftsy. I printed out 3 pages, which is 6 sections and got started! Once each section was done, I alternated them to create the wave you see below. Chelsea, I hope you like it because I love how your quilt is turning out! I enjoyed getting to work in this color palette, and if you decide you don’t want this – I will totally take it off your hands for you! 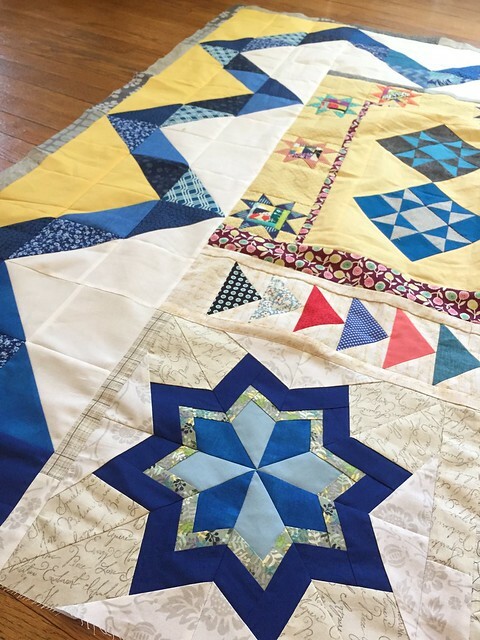 It’s been 6 weeks, so it’s time for our quilts to continue their journey! 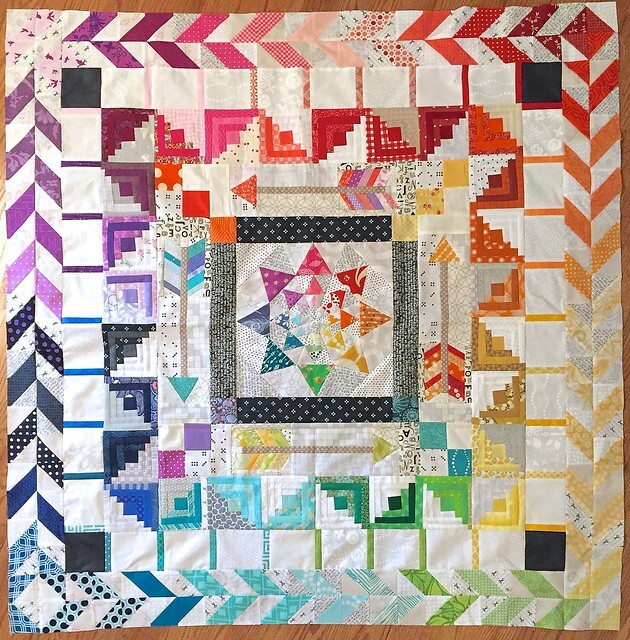 I joined the Round Trip Quilt bee, which is made up of US and Canada bloggers that met through the New Blogger Group from Plum and June. We are a pretty relaxed and free form bee group. 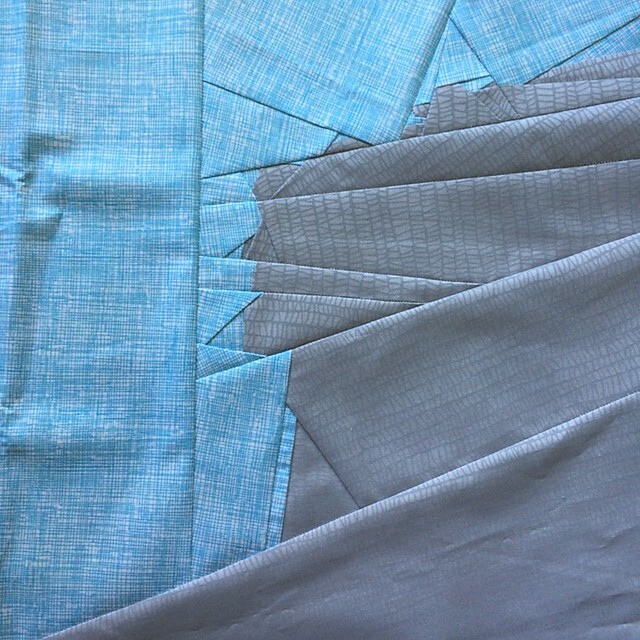 We don’t make (necessarily) an entire border all the way around each time, and we usually (but not always) sew an additional piece to one or more sides of the quilt. I love our rules because as a group, there are some amazing quilts taking shape. 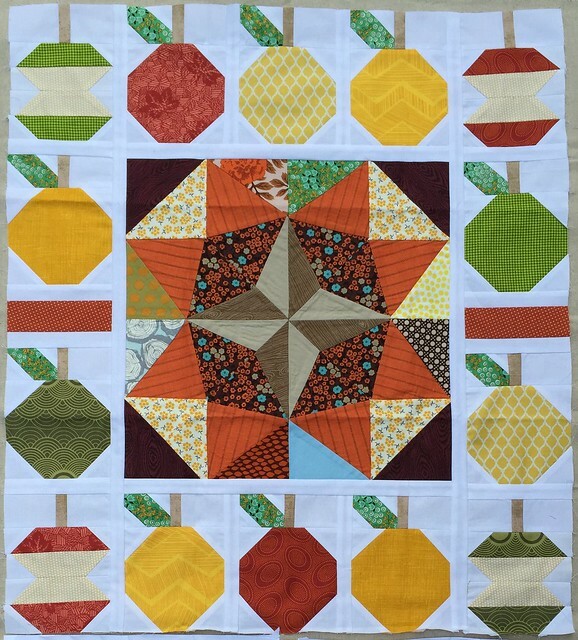 This round I have an autumn themed quilt from Christina at Wips and Tuts. 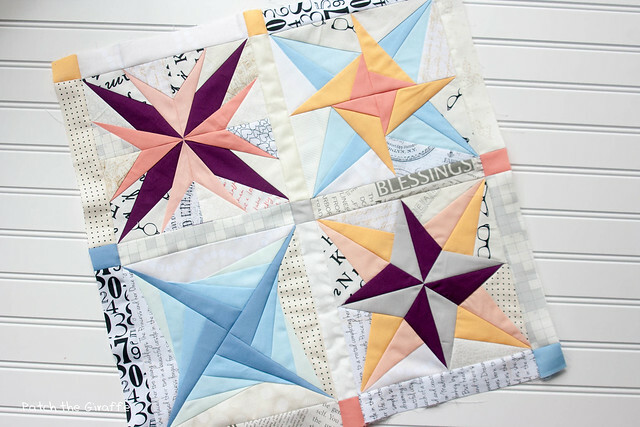 She used the center medallion from the Liberty medallion quilt that went around quilty blog-land awhile ago. It’s from the book Liberty Love by Alexia Marcelle Abegg (affiliate link). This is such a fantastic medallion center, and it’s being added to my never ending bucket list of quilts. 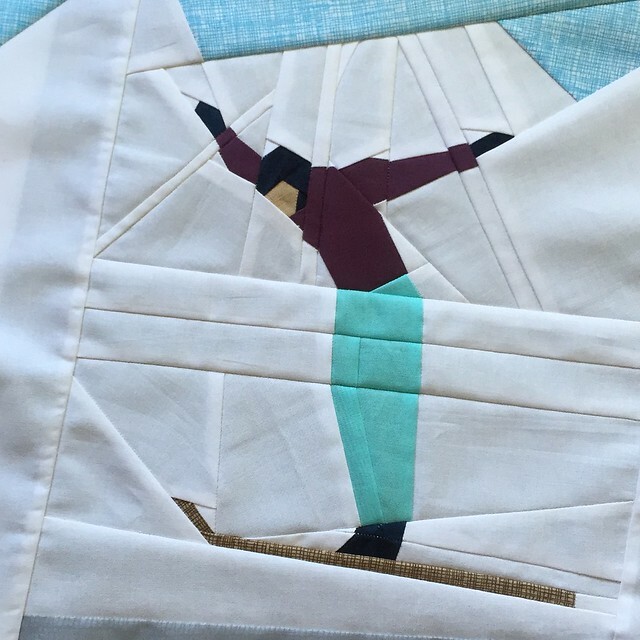 As soon as I saw her initial blog entry explaining the theme of her quilt, I got excited. 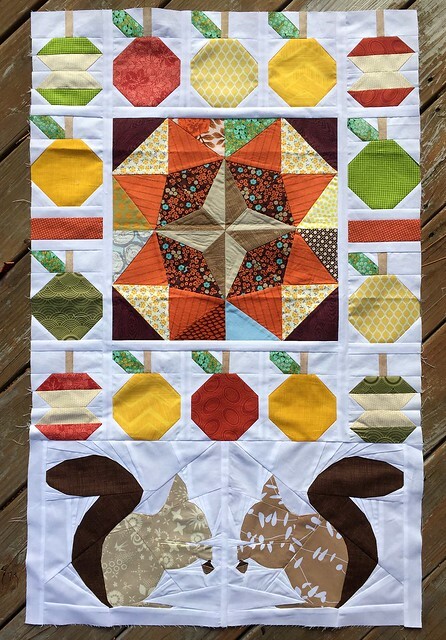 I love fall, and I was fortunate enough to get this quilt during fall. It felt perfect. Then I discovered I had more ideas than I could easily narrow down! 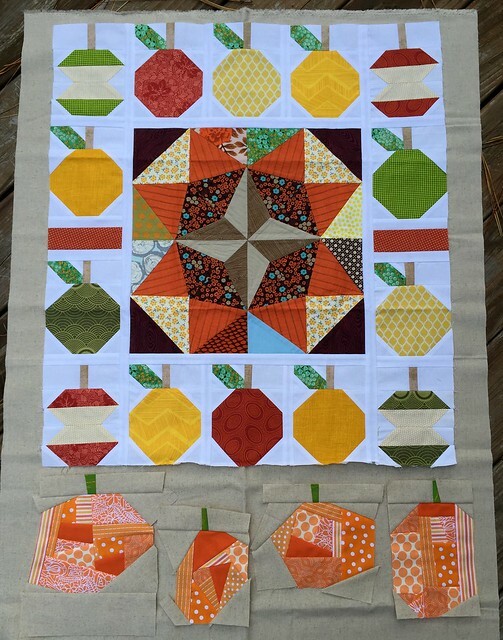 Seriously, my Round Trip Quilts pinterest board is over half autumn block ideas. 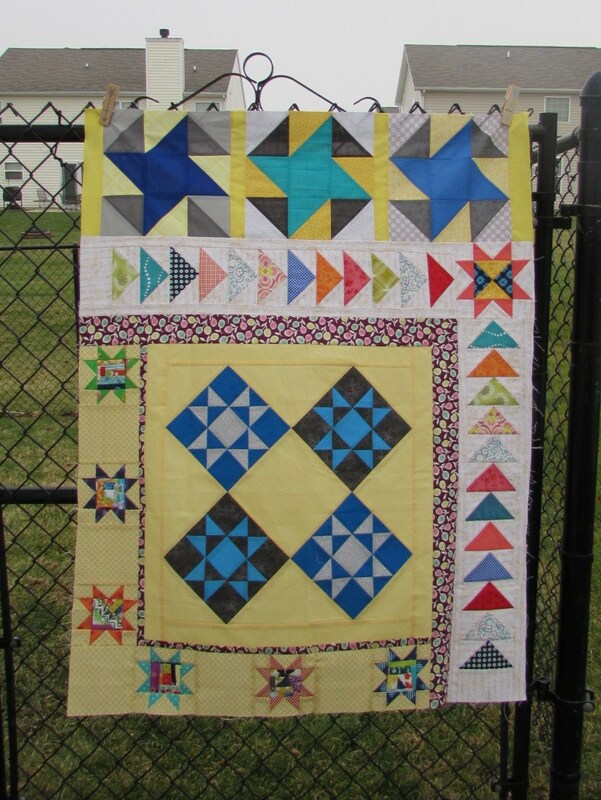 Kim at Ties that Bind Quilting added the first round to this quilt. She added apples all around the center, which is so perfect for fall! When I pulled the quilt out of the package, I had two immediate thoughts. 1 – this is awesome and 2 – this is huge for only being the second round! As I said before, I was actually stymied by how many directions I could take this quilt! I even had a misstep before deciding on the final choice. My first attempt were some freeform pumpkins, that while I like them, I did not like them with this quilt. It’s alright though – they will make some pretty sweet placements for next fall. I actually hate them less in this photo than I did initially. Ironically, the linen I laid down so that I didn’t get the quilt dirty would have made a nice border and made them sort of work even though the style is still wrong for where the quilt is right now. 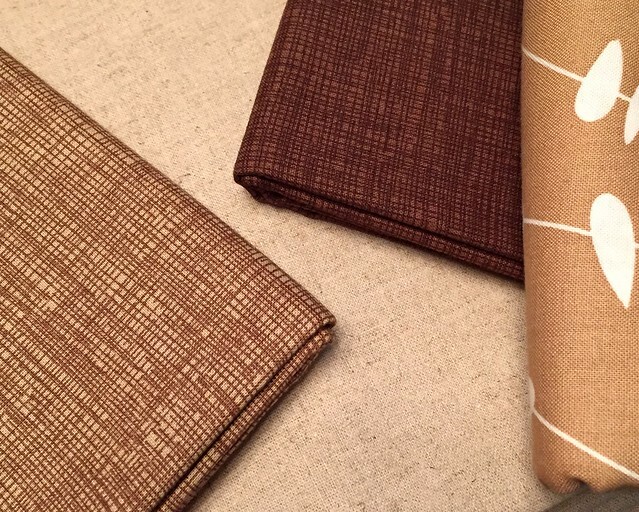 Next, I asked Christina on Instagram (with this selection of brown fabric) how she felt about squirrels because she had mentioned woodland creatures as a possible inspiration topic. Squirrels (or bunnies as my daughter calls them), are a very popular topic in our house. The squirrels in the backyard are entertainment during most meals, and there is a Curious George episode that features squirrels that she absolutely loves. Thus, when I found the squirrel pattern from During Quiet Time, it seemed like a perfect option. Plus, Christina had ok’d it as an option. 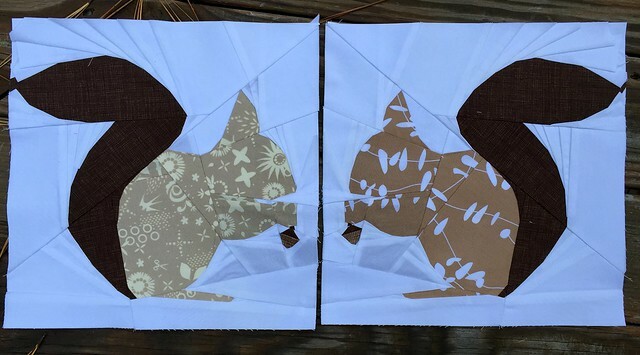 I reverse printed one squirrel so that the two squirrels could be facing each other. I wish I would have taken a picture of the back before I peeled the papers off, because all those reverse printed letters and numbers looked pretty funny. Although, because I was making two at the same time with such similar colors, having one set reversed was a lifesaver so I didn’t connect the wrong parts! I did have a moment of doubt as to the scale of these two guys. These blocks are 12″ square. They are pretty large squirrels. 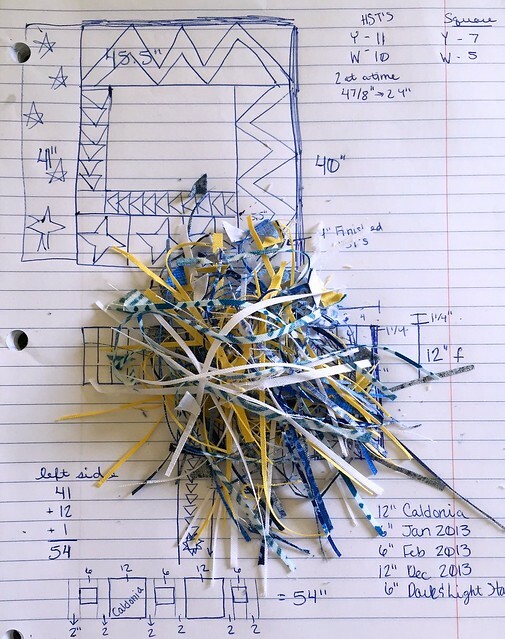 I considered reducing the size, but due to the paper piecing pattern, if I had done that there would have been some spots that I never would have gotten the paper out of. Then, I felt better when I considered that the squirrels are actually is really good proportion to the size of the apples. Christina, I hope you feel the same way! Next I just had to add some sashing at each side and in the middle so that the squirrels lined up properly with the rest of the quilt, and I was ready to pass this quilt on! 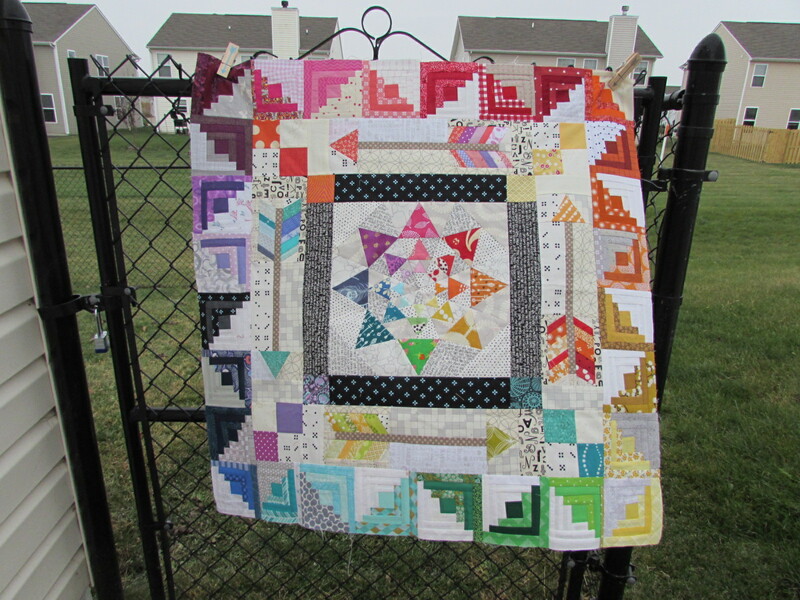 This quilt moves on to Liz at Green Cheese Quilting next and I can’t wait to see what she does with it. The next quilt I received is the center from Chelsea at Patch the Giraffe. She picked a really soothing palette that I am looking forward to working with. During the Plum and June New Blogger Hop, several bees were started all over the world. 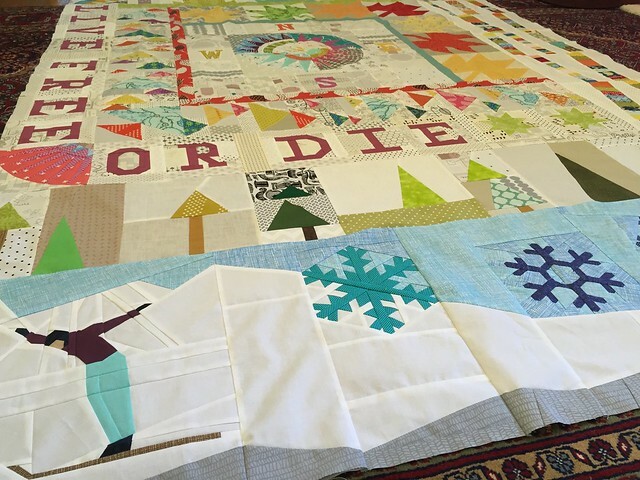 I’m taking part in a US/Canada based round robin bee called Round Trip Quilts. We are starting this long journey this week as we mail the start of our quilts to the first person. 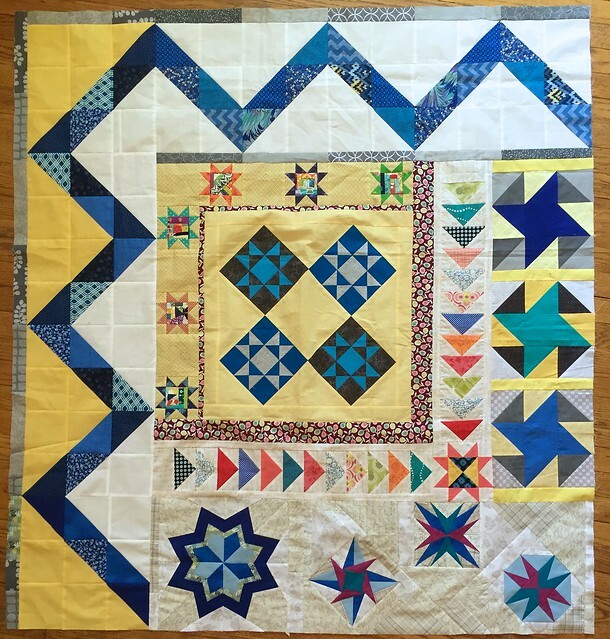 I went through many ideas for what I wanted this quilt to be. I considered an ode to North Carolina (where we’ve lived for 5 years now – amazing for an Army family! ), a sewing themed quilt for me, but landed on a quilt for my daughter. 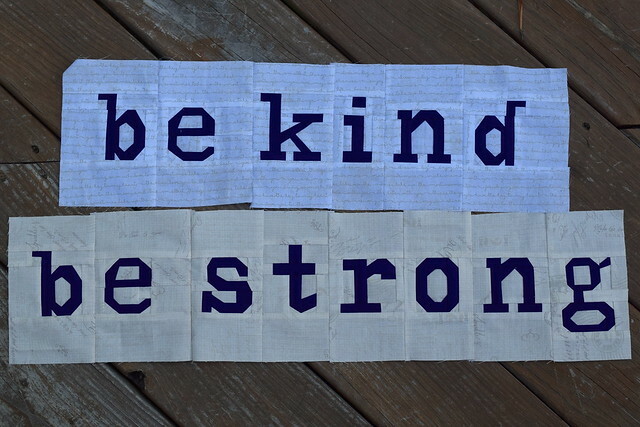 While preparing for a different idea, I decided I wanted to paper piece the phrase “be strong”. Once my husband and I saw how great it looked, we started coming up with tons of other ideas for these phrases to include in the quilt. Then, I realized that instead of just one of these phrases in my quilt, I wanted the theme of my quilt to be based on this. I have provided paper pieced phrases to be scattered throughout the quilt. I want the other members of the bee to create blocks or sections to separate the phrases. This isn’t really the traditional “center” that usually start a round robin, but I really loved this idea and hope everyone else enjoys working on it as well. 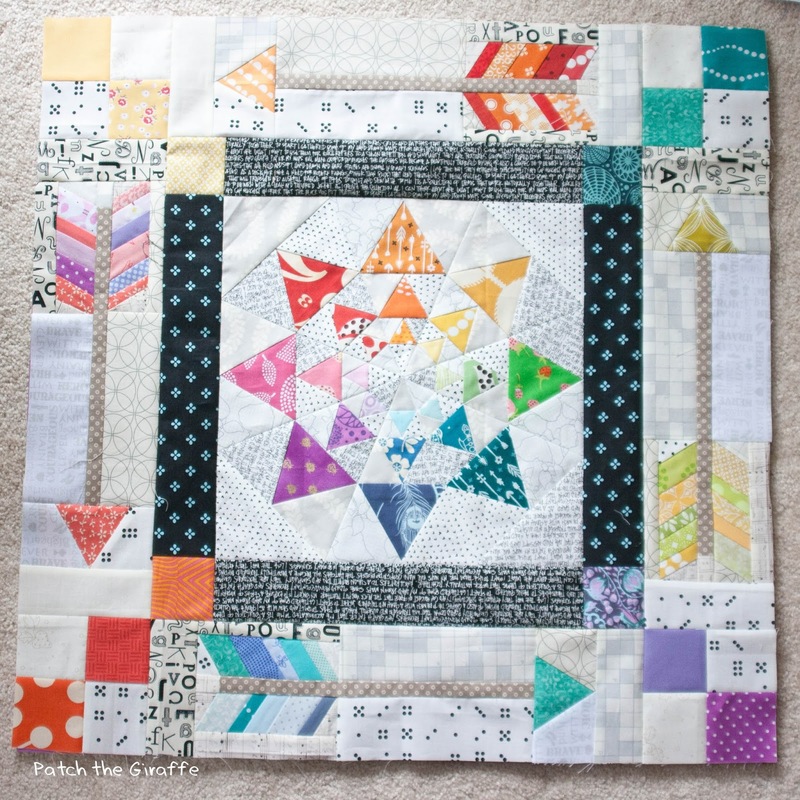 I don’t have a preference for how they separate the phrases – it can be pieced blocks, paper pieced designs, row by row style blocks, or anything else I can’t even dream of! I think this will turn out really cool. Then at the end, I will hopefully be able to size this up to a twin size quilt by adding some of the longer phrases that I did not have time to paper piece before the first mailing. I suggested filling in the spaces with things a little girl would like… such as animals (red fox is currently a hit in our household), flowers, fruit, flying objects (birds, butterflies, airplanes), deer, dogs, outdoors, and traditional pieced blocks. To include Mom and Dad, I mentioned that I like sewing and Dad likes fly fishing. In case anyone wants the details of these phrases, I used the “Just my type” alphabet pattern from Quiet Play. It looks great, but takes quite a bit of time! I printed the pieces at 120%, which makes them 6 inches tall. 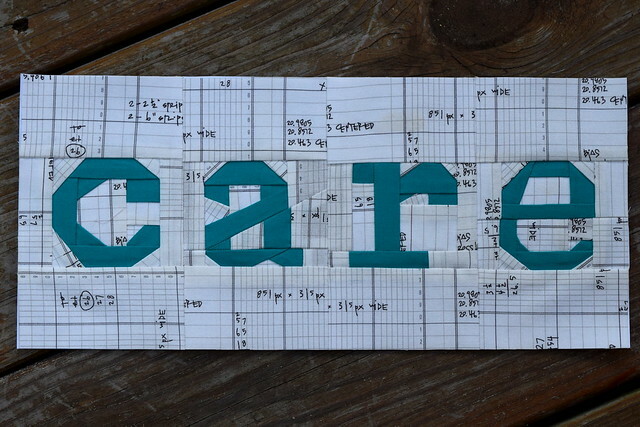 I wanted the letters inside of the words closer together so I cut the edges off 3/4″ from the edge of the letter. I usually used the full width of the pattern for letters that started or ended words. 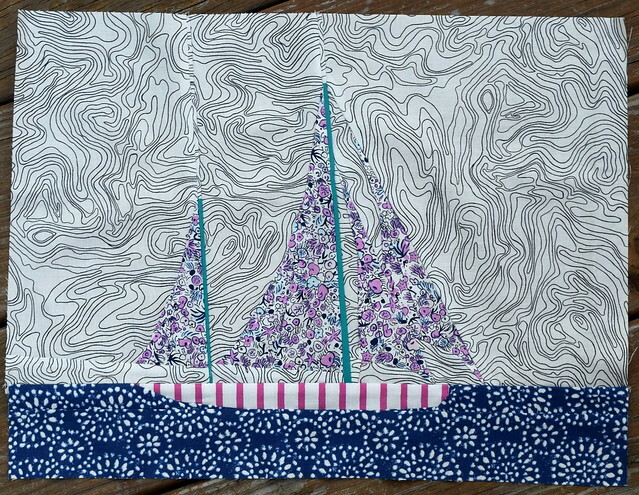 My contribution to the “center” is this sailboat. I was fortunate enough to sail quite a bit growing up (although on nothing near as fancy as this boat! ), and so counted it as something I like to fit in with the phrases. 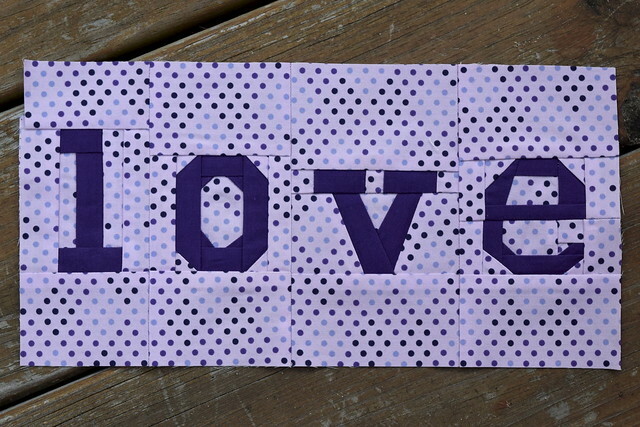 This pattern is from Daisy at Ants to Sugar, and she will be releasing this pattern on Craftsy soon.